Fetal Programming: Can pregnancy events determine baby's future health? Different factors and events during pregnancy can influence the health conditions of the baby later in life. This phenomenon is known as Fetal Programming. In this article, we discuss how stress and mental health conditions can have an impact on the baby’s future health. The environment inside the mother’s womb is very important for the growth and development of the fetus. This is critical to determine good health after birth (both in the childhood and adult life). During pregnancy, not only the baby’s organs grow, but their functions also undergo programming. This determines how well these organs are going to function after the baby is born. As this ‘programming’ takes place during the fetal phase (i.e., inside the mother’s womb), this phenomenon is called Fetal Programming. Certain factors during pregnancy can influence this fetal programming process. As a result, there could be some permanent (often subtle) alterations in different organs. These changes, in turn, alter the optimum functioning of the organs. Such changes cannot be detected during pregnancy and after the birth with any available medical tests. These embedded changes can result in diseases later in life. It was first described by Dr. David Barker (Ref 1). He observed the fetal origin of adult diseases. Therefore, the Fetal Programming phenomenon is sometimes called as ‘Barker Hypothesis’. He noted that if the mother suffered from severe malnutrition, then the babies had low birthweight. These babies were at higher risks of developing Diabetes, heart disease and high blood pressure in their later life. Both physical and psychological conditions of the mother can have an impact on the Fetal Programming. What determines the future brain health of the fetus? 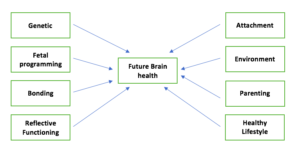 Many factors during and after the pregnancy influence the future brain health of the human being. They include the inherited genes, diet, inflammation during pregnancy, external toxins, bonding, attachment and fetal programming. These factors affect every individual differently. Therefore, fetal programming is NOT the only determinants of future health conditions. 1. Usually, by 20 weeks of pregnancy, fetal brain cells (‘Neurons’) have been formed (‘Neurogenesis’) and relocated (‘Migration of the neurons’) themselves to form different parts of the brain. Then the neurons join with each other to transmit the brain signals. This occurs through a special connective junction, called ‘Synapse’. 2. Neurogenesis starts on 42 days of pregnancy (’embryonic life’). 3. Nerve cells can generate at a rate of over 100 000 new cells per minute. 4. Around 8 weeks of pregnancy, the migration of the neurons start. 5. By 28 weeks of pregnancy, the baby’s brain contains billions of neurons, 40% more than the adult brain. – The rate for synapse formation increases to a rate of 40 000 synapses per minute. – Complex structural and functional changes in the brain take place (such as the formation of secondary and tertiary gyri of the brain, ‘dendritic arborization’, ‘axonal elongation’, ‘synapse collateralization’) and the development of the cover of the nerves (myelination). In summary, during the entire pregnancy fetal brain undergoes rapid growth and development. Therefore, any adverse factor/ pregnancy event can cause disruption in the structure and function of the brain. This can happen at any stage of pregnancy. The effect on the brain function would be determined by the time of the pregnancy when this happens. The stress and mental health conditions could have an impact at different cycles of the brain development. For example, they can interfere with neurogenesis, migration of the neurons, and/ or synapse formation. Therefore, this depends on when the mother is undergoing the stress/ mental health conditions. Can psychological factors lead to fetal programming? Different psychological factors during pregnancy can result in fetal programming. It is estimated that 10-15% of the emotional and behavioural problems are due to stress/ anxiety/ depression of the mother during pregnancy. Research has shown that fetal programming is not only caused by diagnosable mental health conditions (such as anxiety or depression) or significant life events (such as natural disasters or death of a child). Mild stressful conditions, such as daily hassles, can also lead to similar changes in the fetus. – any untreated mental health illness, such as anxiety and depression. – Pregnancy-specific anxiety, such as tocophobia. What are the impacts of Fetal Programming? As discussed above, the baby’s future health is determined by several other factors apart from the fetal programming. Therefore mental wellbeing is vital during every pregnancy. Does the placenta have any protective role? The placenta plays a vital part in protecting the baby from any harmful chemical present in the mother’s blood. It acts as a protective barrier to the growing fetus. Placenta filters the harmful chemicals present in the mother’s blood. As a result, such chemicals cannot enter the baby’s circulation. Therefore, a healthy functioning placenta can prevent the fetal programming process. Psychological distress/ mental health conditions interfere with this protective function. As a result, the fetal programming process is affected. How do the psychological factors influence the fetal programming? The exact pathway of the fetal programming is not known. a number of potential pathways have been identified. Both physical and psychological health conditions of the mother during pregnancy can influence fetal programming. In this article, we would discuss the psychological conditions of the mother. Research has shown that stress during pregnancy and untreated mental health conditions of the mother (anxiety and depression) during pregnancy are important factors for fetal programming. Cortisol is a hormone which is secreted at the time of stress. This is harmful to the fetus. However, in normal circumstances, cortisol in the mother’s blood cannot enter the growing fetus. This is due to the presence of an enzyme in the placenta. This enzyme is called, 11β-hydroxysteroid dehydrogenase 2 (11 βHSD2). This enzyme breaks down cortisol at the placenta to an inactive product. As a result, the cortisol cannot cross the placenta and enter the blood-stream of the fetus. The psychological stress of the mother leads to reduced secretion of 11 βHSD2 at the placenta. As a result, this protective barrier function on the placental bed becomes ineffective. As a consequence, cortisol can freely enter the fetus. Cortisol interferes with the function of the placenta and affects the development and function of the baby’s brain. Psychological stress and mental health illnesses are now thought to activate the inflammation process in the body. This leads to the activation of the immune system. This results in the release of some chemicals in the blood (called ‘cytokines’). One of the important cytokines in this regard is Interleukin – 6 (IL-6). Some research has shown that IL-6 could be responsible for the fetal programming. Serotonin plays an important role in the developing brain of the fetus. Unlike adults, the fetal brain does not produce its own serotonin until late in pregnancy. Placenta produces serotonin and supplies this to the fetus at an optimum level. This helps to develop both the structure and function of the fetal brain. Animals studies have shown that increased serotonin exposure (to the fetus) during pregnancy is harmful to the developing brain. This is associated with alterations in many neuronal circuits. Such changes can lead to behavioural problems later in life. Stress and mental health condition of the mother can lead to over-exposure of the fetus to serotonin. In this way, serotonin might contribute to fetal programming. It is still not exactly known how this over-exposure happens. Some researchers think that there can be the poor response of the enzyme Monoamine A (MAO-A) at the placenta. MAO-A breaks down serotonin to its inactive product. As a result, serotonin in the mother’s blood can not enter the baby. During stress, MAO-A (at the placenta) is thought to become less effective. As a consequence, an increased amount of serotonin from the mother’s blood can enter the fetal blood circulation. This increased serotonin interferes with fetal brain development. One theory suggests that some hormones released during stress (such as noradrenaline and adrenaline) cause constriction of blood flow in different parts of the body. During pregnancy, this could also affect the blood flow at the placenta. This could reduce the supply of blood and vital nutrients to the fetus. This, in turn, could lead to an altered functioning of different fetal organs (and therefore, cause fetal programming). However, as the pregnancy advances, the mother’s HPA axis becomes less responsive to stress. This is due to the secretion of Corticotropin-Releasing Hormone (CRH) from the placenta. This sends a negative feedback to the HPA Axis and down-regulates its response to stress. Epigenetics is the modification of gene expression rather than alteration of the genetic code/ DNA sequences itself. During the baby’s development inside the mother’s womb, some small particles (‘molecules’) can attach with the DNA. They can activate, deactivate or modify the function of a gene. Many epigenetic changes are permanent, although some are temporary. Epigenetic changes can be transmitted from one generation to the next. 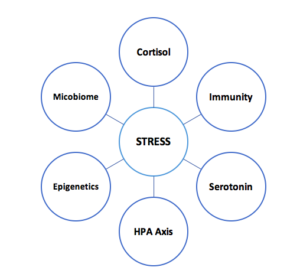 Stress/ mental health conditions are thought to facilitate some epigenetic changes. However, the exact pathway is still not very well understood. The collection of all the microorganisms that colonise the inside and outside of our body is called microbiota. Each of these microorganisms contains a set of genes. All such genes are collectively called Microbiome. The microbiome of the human digestive system (the ‘gut microbiome’) is thought to play an important role in the function of different organs of the body. This includes the adequate function of the brain and the nervous system. Researchers have shown that the stress during pregnancy can alter the baby’s gut microbiome. This, in turn, can influence the fetal programming. As a result, this could lead to behavioural and psychological changes later in life. What is the role of diet in the brain development? It is important to remember that malnutrition includes both under-nutrition and over-nutrition (over-weight/ obesity). Over-nutrition can be associated with unhealthy food habits with high-calorie diets. These diets might be poor in essential micronutrients. Therefore, nutritional deficiency can affect fetal programming all across the world (i.e., both in high-income and low- and middle-income countries). This is important in the early stages of development of the brain and the spinal cord. Folic acid deficiency leads to Neural Tube Defects. This is also required for the formation of the Neural Tube, along with Folic Acid. This plays an important role in the function of the genes (‘DNA methylation’). Vitamin B12 is also required for the formation of certain important hormones (such as Epinephrine) and essential amino acids (such as methionine). This is important during different stages of the fetal brain development, such as the neuron formation, neuron migration, and synapse generation. This is an amino acid and important for the formation of neurotransmitters (chemicals that carry signals between the nerve cells, i.e., through the synapse). This is essential for the formation of the cover of individual nerve cells (‘Neuron Cell Membrane’). Iodine plays an important role at different stages of the fetal brain and the Nervous System development. This includes neurogenesis, nerve cell migration, synaptogenesis, and the formation of the myelin sheath. In summary, a healthy and balanced diet of the mother (sometimes with nutritional supplements) is vital for the growth and development of the fetus.The effects of the mother’s stress and mental health conditions could be exacerbated by poor diet/ nutritional deficiency. Psychological wellbeing is vital in every pregnant woman. In fact, this is true for the entire life, including both before and after the pregnancy. – Supporting women (and partners) when a diagnosis is made of a fetal heart defect/ Neural tube Defect or other birth defects/ anomalies. – Supporting women (and partners) if any pregnancy complication develops, such as Gestational Diabetes, Preeclampsia, Obstetric Cholestasis and the restriction of fetal growth. – Supporting women (and partners) with a previous pregnancy complication, such as miscarriage, stillbirth, shoulder dystocia, and traumatic birth experience. – Supporting women (and partners) who required assisted reproductive techniques. – Supporting women (and partners) who has pre-existing health conditions (such as Diabetes, Epilepsy, Heart/ Neurological/Kidney/Rheumatological/ or other conditions). – Supporting women who are the victims of intimate partner violence, going through court proceedings (such as divorce), homeless or do not have good family/ social support. In an ideal world, any pre-existing health condition (including mental health illnesses) should be adequately treated before the pregnancy. This may not be always possible as many pregnancies are unplanned. However, it is never too late to seek help and have the adequate treatment and support. Mental health conditions, such as anxiety and depression are common. They can develop for the first time during (or after) pregnancy. Sometimes this can happen to women who never experienced any mental health problem in the past. 1. Barker DJP, Osmond C, Kajantie E, Eriksson J. Growth and chronic disease: findings in the Helsinki Birth Cohort. Ann Hum Biol. 2009;36:445–58. 2. Glover, V. (2015). Prenatal stress and its effects on the fetus and the child: possible underlying biological mechanisms. Adv Neurobiol, 10, 269-283.